How appropriate that I received this book on Columbus Day! Both Doyle and Christopher discovered a new world that lay just outside our ken in their time. Chris's new world led to the birth of a new kind of freedom in a land called America. 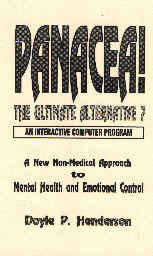 Doyle's new world leads us into a new kind of freedom from unwanted feelings in a land called PANACEA!. In America settlers were able to choose their neighbors and live and grow unfettered by the stifling strictures and dogmas of the Old World. In PANACEA! settlers will be able to live and grow unfettered by the stifling strictures of their old world of automatic feeling states and emotional responses. "Surely, you're joking, Mr. Henderson!" you might say. "A remedy to heal all disease?" No, PANACEA! is not a remedy to heal all disease. It is merely a remedy for eliminating all unwanted emotions. Dr. Doyle tells us, in effect, "Take this pill and you will no longer react to situations in ways you don't like, from now on." It's up to each of us to discover for ourselves, in solitude, sitting in front of our PC's, if PANACEA! provides a remedy for the source of all the dis-eases that human flesh has been heir to, up until now. "How can this be?" you ask. "How do you react to situations that you don't like?" I ask. "Well, I get upset when my wife spends money. I yell at her, and then we don't talk for weeks." Some lack of ease exists between you two for that period, huh? "Yes, can PANACEA! help me with that?" Okay, here's the skinny: you read Doyle's book (at least some of it), you sit in front of your PC and run his PANACEA! software. It guides you through a process, that, when you're finished it, will permit you to talk to your wife about money without creating a two weeks long relationship-challenge (fight). "Wow! And it will work for all negative interactions between her and me?" Yes, and even more. It is truly as its name PANACEA! suggests, a universal remedy. "How does it work? I never heard of anything like that before." Doyle Henderson discovered an amazingly simple truth: all our emotional states are stored only between birth and five years old. All emotions or feeling states we experience after five years old are merely re-creations of those original feeling states. He calls them doyles to distinguish these original creations from their later re-creations as we grow older. "Hey, wait just a minute! The New Orleans Saints won an NFL Playoff Game, and I felt an exhilaration I never felt before, I can tell you that!" Yes, and even more. What actually happened to you was that you re-created several doyles that fired off at the same time as a result of the great victory for your favorite team. That combination of doyles you experienced never happened before. "Never happened before is right! Not while Mora was coach!" Right, the doyles that made up the exhilaration you felt, according to Doyle's theory, you had first experienced and stored between the ages of birth and about five years old. It was the combination that was new. And each of those separate doyles could be traced down at your PC and eliminated from your life. "Hey, that's crazy! I like feeling this way!" Right, so don't trace that feeling, those doyles, down. Who would want to be a real, live Mr. Spock, to react unemotionally to every circumstance in life? "Maybe a nuclear plant operator, or an astronaut, or a jet fighter?" Yes, and the father of a new teenage driver, a wife of an alcoholic, a victim of sexual abuse as a child, a drug addict, an angry convict, the list is nearly endless. Doyle's book offers help and suggestions to all of these and more. "Hey, you're beginning to sound like a commercial for this guy Doyle's book." Yes, and even more. But none of my words will help you eliminate any unwanted emotional responses in your life. Only you can do that. 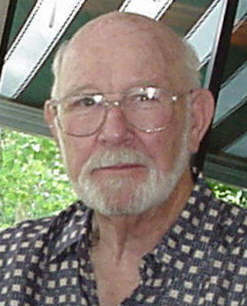 Check out the website founded in honor of Doyle Henderson www.doyletics.com on the Internet for how you can proceed to improve the quality of your own life. With the information on this website inspired by Doyle's book and program, you can begin to improve the ecology of your own life immediately.